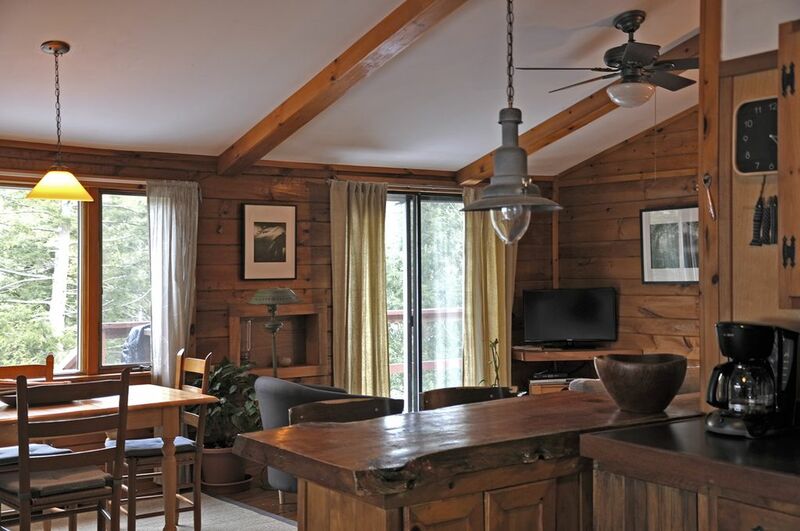 Two bedroom riverfront cabin on Schroon River Road. 468' of private riverfront. Bright and airy, this immaculate log cabin (approx. 850sq. feet), is fully furnished and well equipped including central heating system, washer/dryer, microwave, Land line telephone, WIFI, Flat screen with HDMI cable connection, and Apple TV. Please bring your tablet or lab top with the appropriate connections. car spaces and room for a boat trailer. 45min from Lake Placid and White Face Mountain ski resort. You may also enjoy hiking trails, horseback ridding, cross-country skiing, ice skating, boating and fishing or shopping at the near by outlet stores. Road when you take exit 24. The cabin street number is on the wall of the garage which you see first as you approach the cabin. there is no mail box on the street with the number. We DO NOT have Cable or Satellite TV. The location of the cabin does not allow for proper satellite reception. Yes. one set per guest per stay. Bring your own if you desire more than a set per stay. Bring your own for swimming, boating etc. Use ours only in the cabin. The cabin by the river was just perfect...well accommodated and the perfect size for our family of four. Maria, the host, responded quickly to all inquiries. The only surprise was that the bathroom was much larger than pictured! It is a beautiful place with a water view! We arrived to a clean cabin. It had everything we needed! The bedding is the best soft cotton and bed was so comfortable! We had snow falling but the driveway and entrance was nicely cleared. The water below you can see from sitting on the couch! It’s like a waterfall! We would defenately stay again! We were very happy with the cabin, the furnishings, the location, and the stunning view. Maria was lovely to deal with and left very clear instructions on access to the cabin and expectations for guests at the house. The ONLY downside, and it is a little one, was that the heat could not quite keep up with very low temps outside (14 degrees). In 5 hours we could get the main living space up to only 64 degrees. So I would recommend the cabin for times other than deepest winter. However, if we had stayed longer, I am sure Maria would have helped come up with a solution. So sorry you couldn't get the cabin warm enough. I wish you had called or texted me to let you know that the bedrooms have a separate thermostat. Having all areas heated I believe would have helped. I also should have made sure to tell the cleaning person to turn on both thermostats before your arrival. We never had an issue at the cabin even with low temperatures and the wood stove is ready to go if needed. I apologize It happened to you. Everything my wife and I were looking for in a getaway cabin. Scenary was amazing, the cabin is very well kept, owner was very nice and we appreciated the privacy it offered. Would definitely come back again. We had a really nice stay. Cabin was very nice a little smaller than we had thought but still was enough room. Everything needed was supplied for us. It was very enjoyable we would certainly think about staying there again in the future. Owner was very accommodating. Overall we were very pleased. This cabin was immaculate!! What a beautiful and cozy place. The view and the sound of the river was amazing. It sounds like your next to a waterfall. Loved this cabin! Pet Fee $75 house trained pets are welcome. The cabin street number is on the wall of the garage which you see first as you approach the cabin. there is no mail box on the street with the number.